Orange Deer Corn and Trailpheez Feeder Mix from the Orange Corn Company is now available at J&N Feed and Seed. 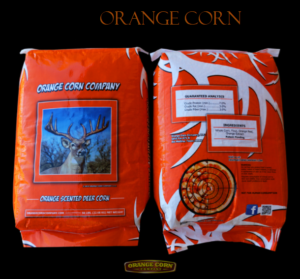 Bring the deer in close with Orange Deer Corn. This 100% irrigated Yellow Corn deer attractant is available in 40 lb. bags. It is a highly potent deer corn attractant mixed with all-natural minerals packed with the irresistible scent and taste of oranges. Best of all, this irresistible deer attractant is grown and produced in Rio Medina, Texas. Want to mix your own deer corn? Try the Orange Corn Company Trailpheez Feeder Mix, available in convenient 5-ounce packets. Use in feeders to give pain corn that irresistible orange flavor and scent. Simple to use, just mix one 5 oz packet of Traipheez Feeder Mix with 150 pounds of corn. This entry was posted on Wednesday, September 5th, 2018 at 12:56 pm	and is filed under News & Updates. You can follow any responses to this entry through the RSS 2.0 feed. Both comments and pings are currently closed.